Louisville, KY - February 7, 2019 - MedAssist, a Firstsource Company, has been named a 2019 Category Leader in the 2019 Best in KLAS: Software & Services Report. The award, which is based on client ratings and experiences of more than 4,500 hospitals and 2,500 clinics, ranked MedAssist #1 in the Eligibility Enrollment Services category. KLAS Research is a healthcare insights company, providing the industry with research on software and services. 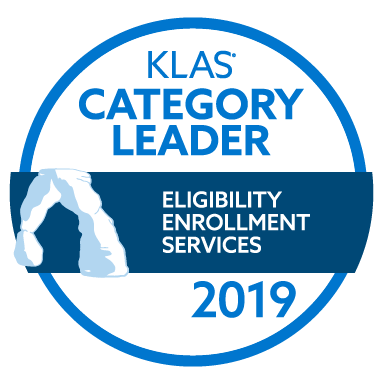 The KLAS Category Leader designation recognizes vendors that stand out when helping healthcare providers deliver quality patient care. In this year’s Software and Services report, MedAssist scored a 92.4 out of 100 and was ranked higher than all other entrants in the Eligibility Enrollment category. In addition to displaying an overall performance score for each product or service, this year’s report also includes grades across six performance categories—culture, relationship, operations, product, value, and loyalty. Categories are comprised of key questions from the standard KLAS evaluation and the grades enable readers to quickly compare vendor performance. MedAssist scored highest in the “value” category with an “A+” grade, followed by an “A” in the “loyalty” and “operations” categories. These top ratings reflect MedAssist’s unique approach to eligibility enrollment. By providing enrollment packages for all 50 states based on state-specific online software, and using the M FOCUS™ solution to automate eligibility in real-time while patients are still in hospital care, MedAssist can streamline the entire financial process for both patients and hospitals. The team will be recognized at the 2019 Best in KLAS Awards in Orlando, FL on Monday, February 11, 2019. For healthcare leaders who want to learn more about an improved patient experience and effectively managing the eligibility enrollment process, visit https://gomedassist.com/eligibility-enrollment-services. KLAS is a data-driven company on a mission to improve the world's healthcare by enabling provider and payer voices to be heard and counted. Working with thousands of healthcare professionals, KLAS collects insights on software, services and medical equipment to deliver reports, trending data and statistical overviews. KLAS data is accurate, honest and impartial. The research directly reflects the voice of healthcare professionals and acts as a catalyst for improving vendor performance. To learn more about KLAS and the insights they provide, visit www.KLASresearch.com.